The Motorola Droid, which we reviewed last year, made its mark. Verizon Wireless went on a spending spree, dropping $100 million to promote the exclusive launch. It was an important move as it gave Android a much-needed push and established the Droid brand name. Let’s not forget that the phone helped Motorola regain recognition as a credible smartphone maker after a somewhat long hiatus. Eight months later, we now have the Droid X. 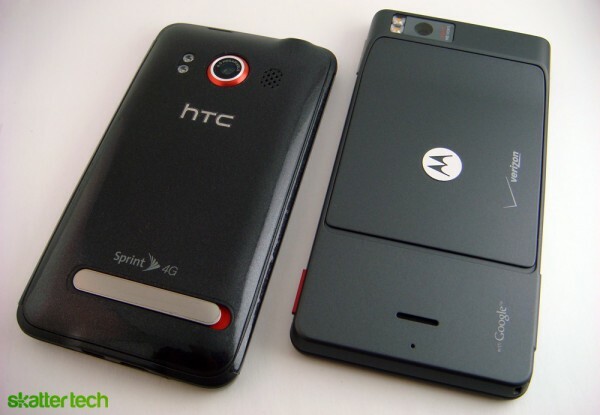 However, it now faces strong competition against Sprint’s HTC EVO 4G and AT&T’s Apple iPhone 4 which offer some great features. But for loyal Verizon Wireless customers who want to stick with the nation’s largest 3G coverage, the Droid X is worth considering. After spending about two weeks with this phone, there’s plenty of good and some bad, but the Droid X is anything but disappointing. Motorola’s Droid X is a clear-cut response to the HTC EVO 4G. While Droid X doesn’t offer a front-facing camera or 4G connectivity, it does sport a TI 1GHz OMAP 3630 processor, a 4.3 inch display, HDMI output, 3G mobile hotspot, 8 megapixel camera, 720p video recording, Android v2.1, GPS navigation, Bluetooth v2.1, FM radio, WiFi b/g/n, and Motoblur. And to meet smartphone standards, Motorola includes an accelerometer, a proximity sensor, and an ambient light detector. 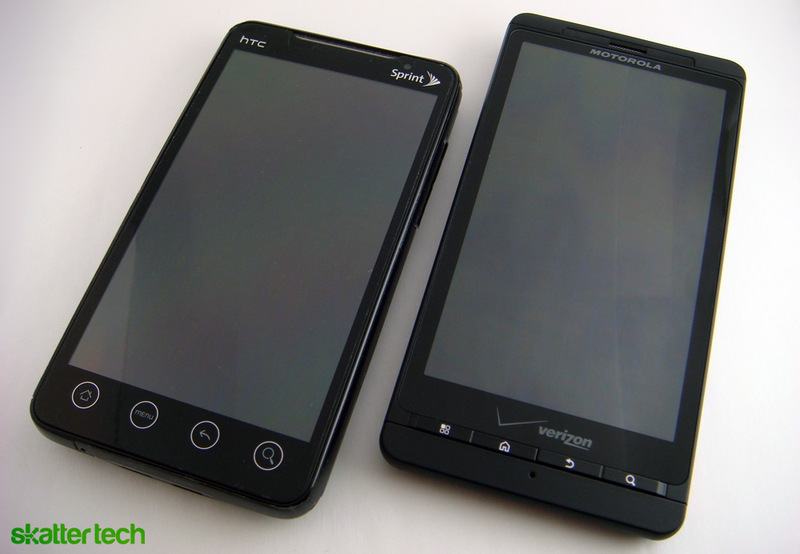 While Verizon’s HTC Droid Incredible sports a familiar size, the Droid X is simply huge. It stands 5 inches tall, spans 2.6 inches wide, and is just 0.4 inches thick. Although those dimensions make it even taller than the already monstrous HTC EVO 4G, the Droid X is also a tenth of an inch thinner. It weighs in at about 5.5 ounces, a half ounce lighter than the EVO 4G. Let’s keep in mind that Apple’s iPhone 4 weighs just 4.8 ounces. While the Droid X isn’t nearly as robust as the original Droid’s tank-like structure, it’s still a very durable device. It is also apparent that this phone can easily survive a drop or two, which the somewhat-fragile and heavy HTC EVO 4G won’t. The Droid X should easily last through a few years of reasonable wear and tear. Considering the technology packed inside, the Droid X is by no means bulky. It is comfortable to hold when navigating through the touch screen interface or when held up for a phone call. Unlike the Apple iPhone 4, which has a fully glossy coat on both sides, the Droid X has an all-around soft matte finish. The material helps keeps dust, fingerprints, and grime hidden, while offering a great grip. And aside from the dark grey paint job, the phone is fairly subtle. While the silver coated earpiece grill, Motorola emblem, volume controls, and power key are a nice contrast, the phone simply doesn’t stand out as much as the EVO 4G or the iPhone 4. 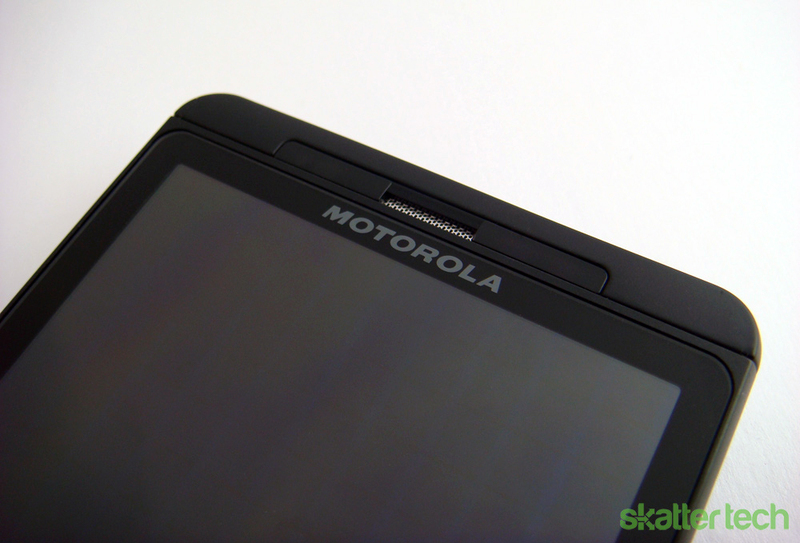 Regarding the odd hump on the back, it’s clear that Motorola simply ran out of space when adding the camera sensor. It’s something that definitely needs to disappear in a future model since it serves no purpose. While it does form a slightly angled surface, it won’t help when it comes to watching a video. 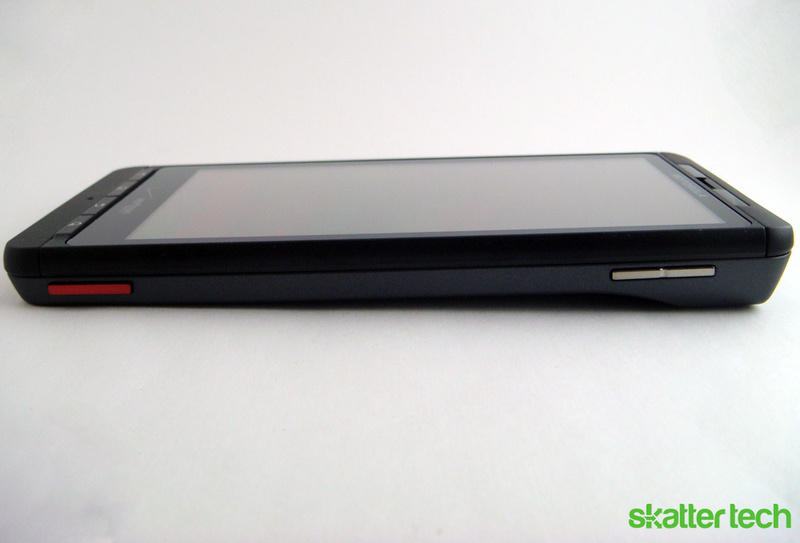 On the other hand, the kick stand on the HTC EVO 4G is a great addition. But in regards to the unnecessary bulge, it is still easy to hold and fits into my pockets just fine. However, let’s not forget what our female writer found: it doesn’t exactly fit into a tight jeans pocket. 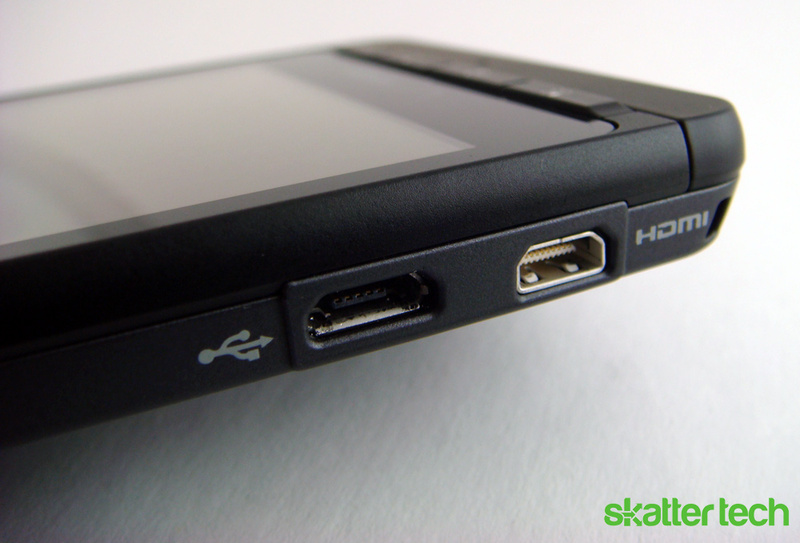 The front side of the Droid X hosts the 4.3 inch touch screen display below the ear piece, proximity sensor, and ambient light sensor. A line of four physical keys for Menu, Home, Back, and Search are directly below the display. While adapting to the EVO’s capacitive buttons was fairly easy, with little-to-no separation, distinguishing between each physical key is difficult. Also, Motorola interestingly changed the order since the original Droid, which might be annoying for upgrading customers. As for ports, the micro HDMI and a microUSB connectors are on the lower left side while a volume rocker and a multi-level camera shutter key are on the right. The top of the Droid X has a power/lock button and a standard 3.5mm headphone jack. 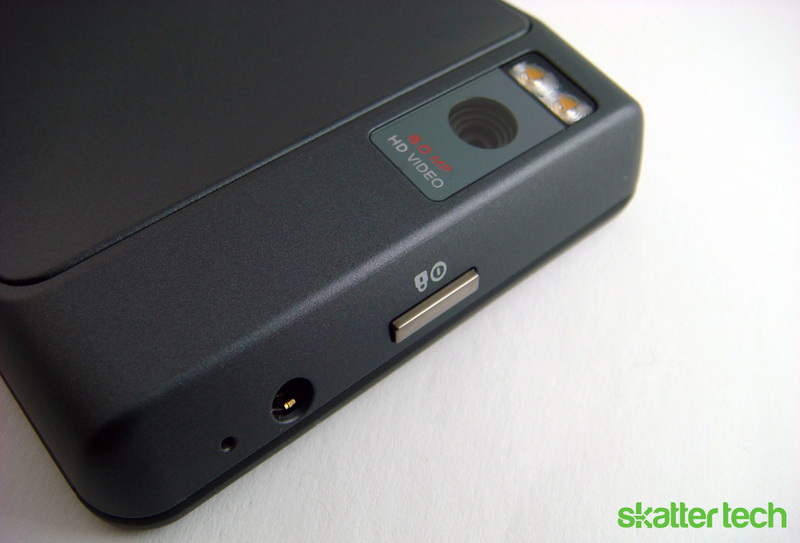 The removable 1540mAh battery pack and the included 16GB microSD card are hidden under a slide-off rear panel. However, it’s unfortunate that the microSD card isn’t swappable without turning off the phone to remove the battery pack. The 8 megapixel camera and complementary dual LED flashes are above the rear panel while the mono speakerphone is directly below. The Droid X also features three microphones for noise cancellation: one on the lower front chin, another on the top of the phone, and the last on the lower backside of the phone. Yes, we all know the 4.3 inch screen is huge, but how does it look? Fortunately, the TFT screen gets the job done despite the fact that it doesn’t offer the pixel density of Apple’s Retina Display on the iPhone 4 or the power efficiency of the Samsung’s Super AMOLED screen on the Epic 4G. Numerically speaking, the Droid X sports a 480-by-854 pixel resolution and 16M colors, which gives it a competitive edge over the EVO’s 480-by-800 pixel display and 65k color set. While the Droid Incredible’s AMOLED screen makes viewing under direct sunlight difficult, the Droid X is still bearable. The ambient light sensors do a great job adjusting brightness to the appropriate levels and viewing angles meet expectations. As for the performance of the capacitive touch screen, it’s actually impressively responsive and accurate. Scrolling through contact lists or dragging down the notification bar was quicker and smoother than the EVO 4G, which was somewhat choppy. While the original Motorola Droid featured the native Android OS interface with minimal modifications, the Droid X comes bundled with the latest version of MotoBlur. 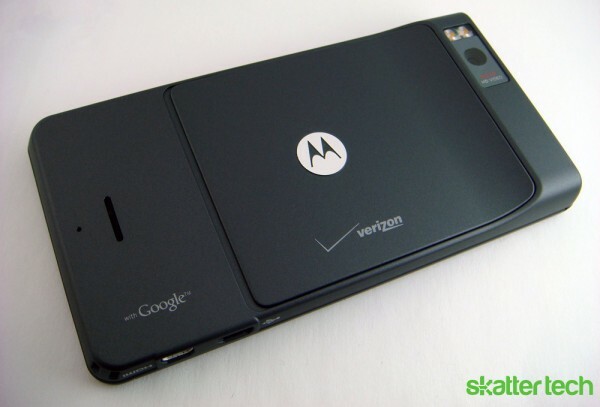 Fortunately, it’s not the same horrid version that’s found on the AT&T Moto Backflip, which left many users frustrated. For starters, the revamped version no longer requires creating a MotoBlur account for using the phone. Users can sign into their email and social networking accounts without having to deal with another step in the configuration process. Motorola clearly hopes to improve the relatively dry Android interface with their own overlay to improve user experience. It’s the same thing HTC does with the Sense UI on all their Android devices. While the introduction of MotoBlur brings some improvements, it also creates some issues. Starting with the advantages, it adds integration for Corporate Sync, Facebook, MySpace, Photobucket, Picasa, Twitter, and Yahoo! Mail. The interface provides an easy unified location for configuring these accounts. Motorola includes its own applications for accessing these services and even a streamlined inbox for browsing through all network updates at once. MotoBlur also brings an interactive Droid Eye live background and a set of widgets for phone settings, calendar events, contacts, date/time, messages, RSS news, photos, social networks, post-it notes, and weather. The idea sounds great, but in reality, Motoblur doesn’t meet expectations. Limited functionality is a widespread issue for just about every Motorola application. Sure, even HTC’s Sense UI has limitations in that regard, but it is well designed and polished. Customers will likely choose to entirely avoid MotoBlur applications and download the full-fledged versions of MySpace, Photobucket, Twitter, and Yahoo Mail. The duplicated functionality is highly unnecessary and does no favors for customers. As for the widgets, these aren’t exactly “fancy-looking” either. They offer minimal customizations and the seven home screens lack the expose view that is included with HTC’s Sense UI. While I did find Motoblur running smoother and snappier than HTC Sense UI, Motorola needs to spend sometime refining their overlay. It may run quickly, but the integration into the Android OS isn’t too friendly. While the HTC Sense UI tries to make the Android OS interface more consistent, Motoblur achieves the opposite effect. For instance, it automatically dumps Twitter contacts into the main address book. While sorting options are available, Motoblur doesn’t allow choosing a combination of Google and Facebook contacts. Users can only filter the contact list for a single service at a time. A Motorola representative did inform us that our unit has some early software, but with a launch date just a week away, I doubt there are any major changes. Apps were scarce when I first dove into the Android Marketplace in late 2009 shortly after the launch of the Motorola Droid. Today, Google’s app store features over 50,000 applications created by over 180,000 developers. Android is now undoubtedly attractive enough for companies to invest resources for building apps for it. Early Android Apps weren’t as polished as iPhone counterparts either, but that’s no longer the case. Within the first few days with the Droid X, I downloaded apps for all the services that I regularly use: Amazon, Barcode Scanner, Digg, Dropbox, eBuddy, Flickster, Google Voice, Mint, Pandora, Photoshop, Qik, Shazam, SpeedTest, UrbanSpoon, and WordPress. While the iOS App Store may still offer a larger selection, Android users won’t be missing out on anything major. As this is a Verizon Wireless handset, it of course features Skype for VoIP calls. 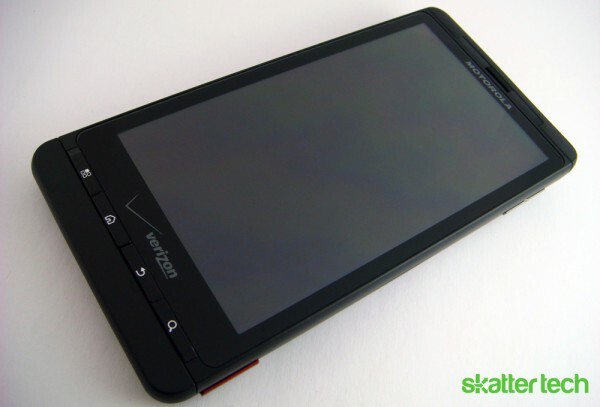 While the Droid X doesn’t have a physical keyboard like the Motorola Droid, it sports both a standard virtual keyboard and Swype. While the HTC EVO’s large on-screen keyboard is easy-to-use, it has a poorly-designed set of directional keys for selecting text and lacked support for multi-touch typing. The Droid X addresses those concerns with multi-touch keyboard and touch-based cursor-selector. While typing on the EVO wasn’t problematic, each key response still had a slight millisecond delay. The Droid X keyboard appears to have done away with that issue as well, typing is just as fluid as with an Apple iPhone keyboard. The landscape mode makes for the best typing experience, but the portrait mode is roomy enough as well. Simply being able to hold down the shift key and selecting a letter simultaneously, as you would on a traditional keyboard, satisfies an expected experience. Despite the EVO’s similarly-sized screen, I found myself typing faster with the Droid X. It’s probably the best Android keyboard out there, aside from Swype being a special exception. Other standard goodies such as auto-correction, spelling suggestions, and custom dictionaries make for an excellent experience. Android natively even features voice-to-text input, which is impressively accurate. While having to speak somewhat slower and clearly enunciating words, it is almost always spot-on. And as we saw at Google I/O 2010, the latest version of Android, Froyo v2.2, will bring further accuracy and performance improvements. As for the Swype keyboard, I won’t go into details here since we recently published a video demo. While that offers a simple walk through of the revolutionary keyboard technology, we’ll also be publishing another in-depth piece regarding Swype shortly. Although manufacturers are pumping megapixels into smarpthones, image quality isn’t necessarily always improving. However, the 8 megapixel camera on the Droid X is nothing short of excellent. The snappy processor and efficient software launches the viewfinder within 2 seconds. The Motoblur customizations bring 8 scene modes, 8 color effects, flash settings, geo-tagging, face detection, ISO sensitivity, and Exposure levels. While the interface is still somewhat rugged and laggy, the Droid X still gets the job done. The interface even offers tap-to-focus capabilities for photos, but was oddly left out for video recording. Holding down the shutter key half way let’s the sensor focus on a target and a full press snaps an image. 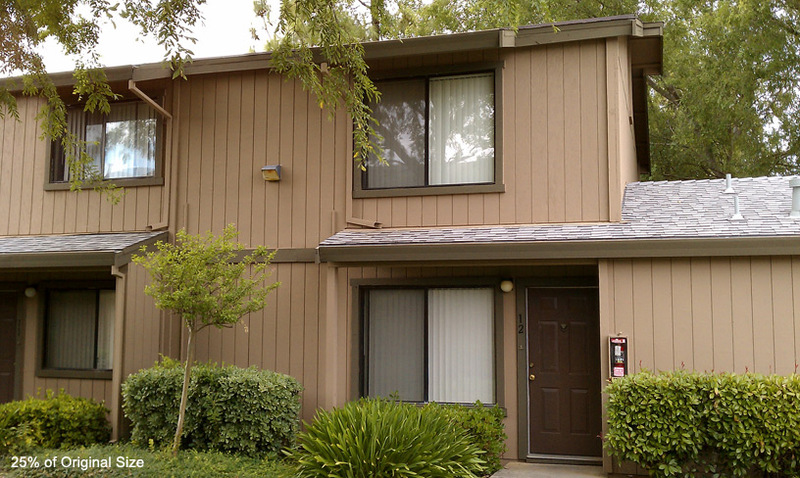 Photos taken in well-lit areas are generally properly exposed and saturated. The built-in dual LED flash truly helps with low lighting. It’s actually about twice as bright as the two LEDs on the EVO 4g, which makes it pretty darn bright. The Droid X performs well when it comes 720p HD video recording as well. I actually found it looking a notch better than video on HTC EVO 4G, which often contains compression artifacts. The Motoblur interface, once again, offers a few custom options. A prominently featured audio option lets users take better advantage of the built-in microphones. Modes for reducing wind noise, narrating on-the-scene videos, and recording interviews are available. A set of eight video color effects are included as well. Motorola includes to option to leave the dual LEDs on during video recording, making for an excellent pocket camcorder even in dark conditions. However the Droid X suffers from the low 24 FPS capture rate that also effects the EVO 4G. A bump to a standard 30 FPS can easily help smoothen video playback. Nonetheless, it’s a damn good pocket camera, but it still won’t be replacing a dedicated HD camcorder anytime soon. As for sharing captured content, the Droid X offers more options than the default Android OS. In addition to Bluetooth, Email, Facebook, and Twitter sharing, it includes support for Online Albums, Picasa, and Printing to Retail Stories (e.g. Costco). With a HDMI output, it’s also easy to playback photo slideshows and videos on a HDTV set. The Droid X is the best camera phone Verizon Wireless has to offer, however it’s still missing one big feature that the iPhone 4, EVO 4G, and Epic 4G have: a front-facing camera. Getting work done with the Droid X isn’t a problem. Google’s Gmail client, push notifications, a threaded SMS application, and a native Android Calendar keep users informed. The built-in web browser renders pages faster than the iPhone’s mobile Safari browser over the same WiFi network. While the Droid X only comes with Flash Lite, we had a chance to demo an early version Flash 10.1 Beta with some employees from Adobe and it ran surprisingly well. Playing videos from ESPN.com or even TheDailyShow.com was impressively smooth. Since the Droid X supports saving files on both internal and external storage, it’s easy to view documents with QuickOffice. There’s even a native file browser to manage content stored on the phone and for accessing shared network folders. A built-in DLNA app offers the option to playback and control multimedia from compatible devices. Other standard apps include an Alarm/Timer, Amazon MP3, Calculator, Blockbuster, Car Dock, News (RSS Reader), Voice Commands, and Voicemail. When it comes to music playback, the Droid X sports the nessary hardware, but lacks a polished user interface. Transferring music onto a microSD card from a Windows 7, Mac OS X, or Linux machine with the included microUSB cable is easy. While Android doesn’t have the iTunes equivalent that iPods and iPhones have, other alternatives are available. Programs such as Windows Media Player 12 play well with the phone. DoubleTwist, a relatively newcomer, is slowly paving its way into becoming a possible iTunes alternative. Even manually copying audio files onto the phone works as the Android OS automatically identifies, indexes, and adds new files to the music library. The internal 8GB of memory gives the Droid X a major edge over the EVO 4G which only offers 1GB. Motorola even outfits their device with a 16GB Class 4 microSD card while HTC only bundles a 8GB microSD. The music player allows users to browse through their collection by artist, album, playlist, and songs. Unfortunately, it lacks filters for genres and composers. The interface shows album artwork whenever possible. There are also modes for shuffle and repeat. Motoblur includes options to adjust Surround and Equalizer settings with presets for 3D Stereo, Home Theater, and Live Stage. The music app can run in the background and an indicator appears in the notification bar while using other programs. Other apps such as Pandora also take advantage of background multitasking capabilities. A default Android widget lets users control the music application without leaving the home screen. When it comes to video playback, much like the HTC EVO 4G, the Droid X makes for great experience with a large 4.3 inch display and a snappy processor to handle HD content. With an over-sized screen, it actually begins to enter the territory of tablet devices such as the Apple iPad or Dell Streak. The TI processor easily handled playback of high-resolution H.264 content. This includes most videos tagged as HD in the iTunes Podcast library. Content from TED Talks and Revision 3 ran smoothly without any pixelation, pauses, or buffering. And for HDTV owners, there’s also a HDMI output on the device, but a cable wasn’t included. A pre-installed Blockbuster application offers access to their library, but it isn’t worth the hassle. It doesn’t stream content, but rather forces downloads of large files. Prices are ridiculous and the app doesn’t allow HDMI output either. The built-in mono speaker on the Droid X is fairly loud and sounds clear, but it’s nothing compared to the HTC EVO. Although audio remains crisp and doesn’t crack when reaching max volume, the EVO 4G gets about twice as loud. While neither feature a set of stereo speakers, the best audio experience still comes with a pair of headphones. Regrettably, Motorola doesn’t include a pair. It’s a rather odd decision, since the phone features an embedded FM tuner that won’t work without a pair of wired headphones plugged in as it’s also the antenna. But on that note, the FM radio feature is a great addition since it doesn’t consume nearly as much power as applications, such as Pandora, that need WiFi or 3G. With my pair of Shure SE210 earphones, music sounded great whether it came from my microSD card or FM Radio. Placing a traditional phone call couldn’t be better with Verizon Wireless. After facing a year’s worth of dropped calls with my iPhone 3GS on AT&T’s network, I was glad to temporarily return to my former service provider. While Sprint on my EVO 4G is wonderful, Verizon simply offers better nationwide coverage. In our review of the original Motorola Droid, we credited it for including a robust microphone that made calls sound clearer than with competing devices. The Droid X once again raises the bar by introducing three microphones, placed on different parts of the phone, to intelligently cancel out unwanted noises. It even has an edge over the iPhone 4 which features only two microphones and the EVO 4G which sadly offers no noise cancellation. I placed a call while in a loud crowded restaurant which had music playing in the background with both my EVO 4G and the Droid X. Motorola’s technology worked as it truly eliminated external noises leaving nothing but a little static buzzing. With the EVO, the caller on the other end could hear things going on around me and had a difficult time discerning my speech. That’s a huge plus for the Droid X. It’s something that should be standard on all smartphones. For speed tests, I opted to use the SpeedTest.net service. After running tests from just about everywhere from the Sacramento Area down to San Jose, I found some interesting results. Verizon Wireless unquestionably had the best coverage. While AT&T 3G speeds often spiked into first place, it was rarely consistent. In fact, Sprint has upload speeds that are 2-3x faster than AT&T. However, when it came to average download speeds, Verizon Wireless came in first followed by AT&T taking second and Sprint taking third. In numbers, Verizon averaged about 1.45 Mbps for downloads and 0.8 Mbps for uploads. That’s a notch better than the 1.2 Mbps download and 0.8 Mbps upload speeds I found with the HTC EVO on Sprint’s 3G network. However, Verizon Wireless is still much slower than Sprint’s 4G coverage in the San Francisco Bay Area. I was seeing peak speeds of nearly 3 Mbps for download and 1 Mbps for upload on my EVO, which is impressive considering Sprint hasn’t officially announced or deployed 4G in the area. Since the Droid X doesn’t ship with Android Froyo v2.2, it doesn’t natively include the portable hotspot technology. Fortunately, Motorola included Mobile Hotspot application is fairly good. It takes less than 15 seconds to start-up, can handle up to five devices at once, and offers three network security options: WEP, WPA, or WPA2. The HTC EVO does the latter, but also supports up to eight users. While I’m a fan of mobile hotspots, Verizon’s service plans have a few pros and cons. The company will charge customers $20/month for 2GB of data. Overage fees are 5 cents per megabyte. Fortunately, paying for the Mobile Hotspot feature doesn’t eat into or effect the required $30 smartphone data plan. That makes it a notch better than AT&T’s plan which charges users $20/month to enable tethering access to the 2GB of data they are already paying $30/month for. Sprint, however, comes out on top by offering unlimited data for both phone usage and tethering on either 3G or 4G networks.Verizon could have easily had an edge over competitors if they chose to offer the Mobile Hotspot feature for free as they do for Palm Pre Plus owners. The replaceable 1540 mAh battery in the Droid X is a tad bit better than the one in the EVO 4G. Motorola claims 8 hours of talk time, but after putting the phone to the test, I found that the phone could easily surpass that limit on a full charge. That’s another step up from the original Motorola Droid which runs for just 6.4 hours and the HTC EVO that only gets 5 hours. With regular mixed usage including sending text messages, checking emails, browsing the web, using the calendar, and getting occasional Google Navigator directions, the Droid X will make it through a day and a half. On the other hand, the HTC EVO 4G barely makes it through an entire day. The improved battery life doesn’t end there, the upcoming Froyo v2.2 update claims to bring power consumption savings. And a Motorola representative stated that a high-capacity 1800 mAh battery would be available during launch, but would add a little less than a millimeter of thickness to the phone. As for charging the phone, it’s easy since the Droid X sports a standard microUSB cable. It plugs into both the included AC adapter and computer’s USB port. I highly recommend finding a power source when running the Mobile Hotspot feature, which will drain a battery in about 2 hours. When it comes to the latest generation of smartphones, the battle between the Motorola Droid X, HTC EVO 4G, and Apple iPhone 4 is closer than ever. However, the Droid X faces on major issue: it offers nothing revolutionary. It doesn’t have 4G connectivity, a front-facing camera, or high pixel density display. While Motorola may have taken the safer route, they still have something to offer: an all-around robust smartphone. For starters, it runs on Verizon Wireless, which Consumer Reports categorizes as the most reliable carrier. Talk-time battery life and call quality is better than both the EVO 4G and iPhone 4. The built-in 8 megapixel camera is the best of the bunch as well. While my experience with the early version of the Motoblur was somewhat disappointing, I can only expect that the Froyo v2.2 update, coming in “late summer,” will solve these problems. While the Motorola Droid made its mark, it’s unlikely that the Droid X will be as well-recognized. It’s by no means an unworthy competitor, but upcoming devices may steal the spotlight. Those looking for a revolutionary device should look elsewhere. With Sprint’s Samsung Galaxy S based Epic 4G hitting the streets and the Motorola Droid 2, which features a physical keyboard, due soon, the Droid X is probably going to become outdated quicker than you would expect. However, at this time, it is the best smart phone that Verizon Wireless has to offer. It will definitely fly off store shelves quickly and won’t disappoint customers. Those interested in buying a Droid X can get one on July 15th for $199 after signing a new two-year contract. Since Verizon Wireless intends to heavily promote this device, anyone eligible for upgrade in 2010 qualifies to upgrade to the this device at the discounted price. I am so glad Verizon finally has a smart phone that can compete with the iphone. I love the Verizon network, but the phones just couldn’t compete for a long time, no “coolness factor”. They finally have a smart phone that I want, I hope I can get mine on Thursday. I just hope that this phone isn’t too big for people with small hands, every review says this thing is massive. I’ve had my droid x for a couple of hours now and i am little frustrated. When i get a text message it does not pop up on the screen and my phone wont vibrate to tell me i have one even when it is on vibrate mode it is really annoying. I also was told that downloading verizon’s navigation would be free and it keeps telling me i can buy it for 9.99 but that’s a verizon problem. The phone itself is huge i am calling it my computer rather than my phone its as big as our house phones. Maybe with time i will get use to it and like having it right now i am finding it very annoying. I will definitly have to attend workshop for some help. For viberating issues, head over to the Text Messaging options. Click the menu button and there should be an option to enable/disable vibrating for SMS notifications. For Navigation, why do you want to use Verizon’s navigator. Use Google Maps. It’s pre-installed on the phone. It offers voice-guided turn-by-turn directions for free. One of the best GPS tools I’ve used. There’s no need to pay monthly fees for that App. And as for the size, if it’s too big you always have the option to return it. The HTC Droid Incredible, which we reviewed as well, is a darn good phone. It is much smaller and easier to carry around while offering a similar set of features. I stood in line at 5:15 this morning and was third in line. Boy, am I glad I did. This phone is the best I have used. It is replacing my MyTouch 3g from T-Mobile. Before that, I had an iPhone 3G. There aren’t any apps that I am missing by making the switch. I did have the same dropped call issue this evening that I have had with every carrier. You would think living in a large metropolitan area that would not be an issue, but…. The FM tuner was a nice surprise. I purchased the dock for the phone as well. It will make the phone double nicely as my alarm clock/bedside radio. If only there were another way to output the audio, the replacement of my clock radio would be perfect. Received my Droid X on Monday and I LOVE it!! Took me all of Monday to get acclimated to it but now I’ve pretty much got it down…I’m sure there are many things that I will still be “learning” as the days go on, but that’s all part of the fun of getting a new smart phone! Omg i cant wait to get this phone in October but my only question is is it awkward to have in your pocket and your walking.Because it looks like it would break in half.Please reply i need to know. yes, it will break in half in your pocket.